Lagniappe New Orleans Street Tile Sign by ScreenDoorArt at HoldUp Art. Hurry! Limited time offer. Offer valid only while supplies last. New Orleans Art, Street Signs, Lagniappe, Mixed Media, Salvage Wood, French Quarter, gift under 40, French for a little extra, trendy signs. New Orleans Art, Street Signs, Lagniappe, Mixed Media, Salvage Wood, French Quarter, gift under 40, French for a little extra, trendy signs. 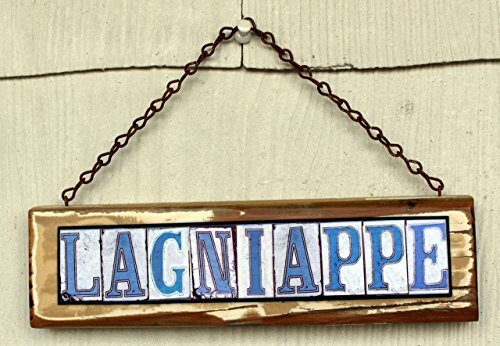 "Lagniappe" is a word derived from Louisiana French which translates to "a little extra". Street vendors in Louisiana still practice throwing in "a little extra" when making a sale. Signs are made from salvage wood and photographic images designed after the old street corner tiles of New Orleans. The signs measure approx. 3.5 to 4" tall and 10 to 13" wide depending on found wood availability. Finished with various coats of acrylic, and old salvage chain. For custom signs, please inquire for a price quote. If you have any questions about this product by ScreenDoorArt, contact us by completing and submitting the form below. If you are looking for a specif part number, please include it with your message.